Requiring police officers to wear cameras isn’t quite as simple as it sounds. The Chapel Hill Police Department is in the process of testing different models of body cameras. In the wake of several highly publicized instances of police brutality, more citizens and legislators are calling for laws requiring police officers to wear body cameras. But how will we store and manage all those billions (yes, billions) of video files? Officer Brandon Perry of the Chapel Hill Police Department is getting ready for his shift. He straps on his duty belt, which includes his gun, badge, handcuffs, Taser, and baton. Today he picks up one additional item: a camera that clips to the front of his uniform. This new addition to Officer Perry’s equipment is not yet standard. He and other officers in the department have been asked to take turns testing out different body cameras. The department is interested in outfitting its officers with body cameras, but before making that investment, they want to make sure they’re getting the best type of camera. At the end of his shift, Officer Perry drops the camera off at the IT department, where a staff member will upload the videos to their servers, along with thousands of other videos files. This isn’t the first time police departments have dealt with managing video files. Dashboard cameras have been commonplace in police cars since the late 90s. But according to Kreft, little research has been done on the data generated by these files. Kreft wanted to provide some answers for police departments looking into starting body camera programs. Kreft reached out to police departments across North Carolina and the country to assess how much data their camera programs—whether body cams or dash cams— generated. He asked 78 different agencies to report their number of files, how big the files were, and the number of hours of footage produced in one month. He also asked them to report how many officers were wearing cameras. 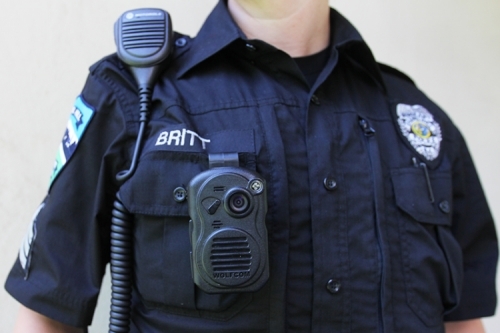 After running the numbers, Kreft found that the average officer equipped with a body camera will produce about 32 files, 7 hours, and 20 gigabytes of video per month at 1280×720 resolution. With about 900,000 police officers serving in thousands of departments across the United States, Kreft found that if body-worn cameras become universal, all those cameras would produce about 29 billion files every month and roughly 1,140 years of footage. That translates into 17.4 petabytes (17,400,000 gigabytes), which is around the same amount of video that one billion users upload on YouTube each month. According to Kreft, storing video files is not the issue. “Data storage is easy to calculate,” Kreft says. “You can go online and enter in what your storage requirements are.” The bigger burden is keeping those files organized and easily searchable. The more files you have, the harder it is to locate one particular file. Those tasks require additional IT staff, which not all police departments can finance during tight budget times. Both body cameras and dashboard cameras capture events that don’t go into police reports, like routine traffic stops. Those videos are considered “nonevidentiary.” At the Chapel Hill Police Department, a routine traffic stop video will be saved for 90 days. To help prevent data overload, Kreft suggests police departments create shorter retention periods for nonevidentiary videos. “I believe a month is probably sufficient, but every institution is going to define their needs differently,” Kreft says. As of right now, Kreft says “nobody knows” how many police departments across the country are looking into or already have body camera programs in place. The U.S. Department of Justice conducted a survey of police departments in July 2013. Of the 254 agencies that responded, only 63 agencies had some sort of body-camera system in use. But that was two years ago—before the riots in Ferguson and Baltimore. That was before the tragic and high profile deaths of Eric Garner, Walter Scott, Michael Brown, and Freddie Gray. But as the public calls for officers to wear cameras, Kreft says it’s important for legislators to create smart policies, so we don’t dive into a downward spiral of mismanaged data. Justin Kreft is a master’s student in public administration and information science at UNC-Chapel Hill. Josh Mecimore is the lieutenant of professional standards and public information at the Chapel Hill Police Department.